If you live in the Brougher Mountain, Divis, or Limavady transmitter areas - you will need to perform a 'first time' retune on your Freeview TV or set-top box when you get up for breakfast on this Wednesday morning. Starting just after midnight on Wednesday 24th October, the next switchover of 2012 will see the number of homes with digital-only terrestrial reception in the UK go up by 647,500 from 97.54% to completed. 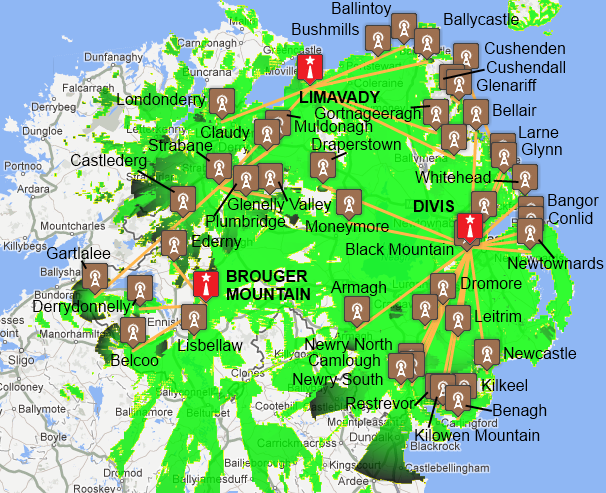 Viewers in Northern Ireland who use the Brougher Mountain, Divis, or Limavady "full Freeview" transmitters (and about 43 smaller relay transmitters) will have no analogue television from Wednesday 24th October 2012. Unless you use cable or satellite to watch television, if you don't use a Freeview box or set, your screen will be blank. Do not expect ANY FREEVIEW television service from midnight until 6am - or a late as mid-afternoon on some relay transmitters (see below for timetable). This means you will not be able to record Freeview programmes overnight. --- but you can watch online here - Watch live UK TV channels and listen to live radio now. Most people need only perform a "full retune" (or "factory reset" or "shipping condition") on their Freeview box or TV, but it would be impossible with five million homes covered by the transmitters, for no-one to have a problem. From Wednesday 24th October 2012 you MUST have a digital television device to watch TV. If you do not have a digital receiver, from Wednesday will have a blank screen. You will be served by the Freeview HD service from Wednesday, but please see this six-point checklist to ensure you really are watching in high definition: Are you really watching free TV in high definition? If you already use Freeview, and can receive all the channels now, check your TV or box is not listed here - TVs and boxes that do not support the 8k-mode. If it is, you will need a new Freeview box. When you now rescan, you MUST do a "first time installation" or "factory reset" scan (sometimes called "shipping state"), not a simple "add channels". Do the procedure you did on "national retune day", September 30th 2009, see Freeview Retune - list of manuals. If you can't recall the procedure or find the manual, please see generic clear and rescan procedure. If you scanned during the first phase of switchover on Wednesday 10th October 2012 - you will have to do it again on Wednesday 24th October 2012. For full details, see: Freeview signals: too much of a good thing is bad for you. If you had no Freeview service before, you will have the BBC channels digitally from Wednesday 10th October 2012. This is a single multiplex of the BBC channels (radio, television and text) for most people. If you didn't get this limited Freeview service on Wednesday 10th October 2012 then you may need a new aerial. ...you now need, from around from 9am (unless shown otherwise) on 24th October 2012 to rescan, and you will get a second Multiplex with ITV 1, ITV 2, ITV 1 +1, Channel 4, Channel 5, Channel 4+1, E4 and More4. And that's your lot if you have a standard Freeview receiver, see Freeview retune - poor public service transmitters. You may wish to install Freesat for more channels, see Compare Freeview Light and Freesat TV. Because of the location of the transmitters, some viewers will find that they can pick up the signal from other BBC and ITV 1 regional studios. 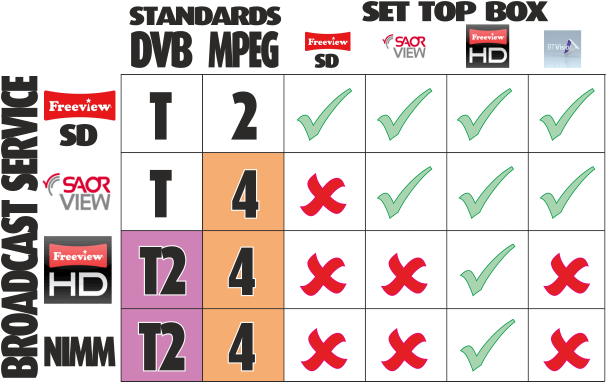 Those viewers with "Freeview HD" (or other so called D-Book 7) receivers will find they are presented with a menu to allow them to pick which BBC One region is shown on "button 1", and which ITV 1 regions appears as channel 3. Viewers with older equipment may have to resort to doing a manual to get the correct signal for the desired transmitter. All Freeview boxes automatically scan the available broadcast frequencies looking for channels, and they do this from C21 to C69. 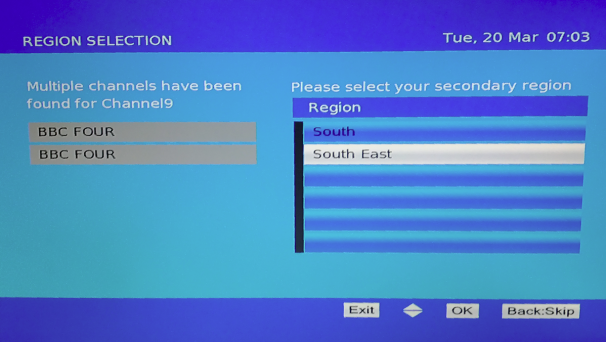 Older Freeview boxes will, if a duplicate version of a channel is found whilst scanning, such as another BBC One region, placed it in the 800-899 channel range. Some Freeview boxes will pick the strongest signals for the "primary" number positions, and some will detect the different regions providing a choice when you perform a "scan for channels". sonia morrow: Some forums say it's not available in the North. The only possibility is: can you receive it from one of the terrestrial transmitters in the South? As Dave quite correctly states, it's only available to viewers in NI via terrestrial transmitters. sonia morrow : In addition to that said, although TV3 along with RT1/2, TG4, 3E etc can easily be tuned in on a Sky boxes "add channels" facility, unfortunately they cannot be viewed using a standard Sky UK viewing card, as a card issued for an address in the Irish Republic is required.